The quite New Haven area of Enugu city recently witnessed an unusual demonstration of madness from a young man. 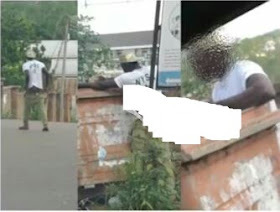 The man said to be a member of the National Youth Service Corps who was wearing the traditional Khaki uniform was reportedly running mad and startling residents. Reports show that the young man was seen roaming about the town while scavenging dirt from the bushes and gutters. At some point he is seen breaking into a run before laughing out bizarrely.